Before house siding materials can be installed, the wall of the house it is to be attached to needs proper preparation. This is true of any other siding, including Everlast Composite Siding. Correct wall preparation means that the siding installed hangs properly on the side of the house and gives additional protection to the wall it covers. The wall of the house on which Everlast Composite Siding is to be installed should ideally be flat and level. It can, to some extent, mask areas where the wall is wavy and not as flat as it should be. This is due to its having embossed grain similar to natural wood. The grain helps maintain an optical illusion of levelness. Other thinner siding materials without similar wood-like characteristics give away unevenness on a houses wall. Furthermore, it can actually be installed over existing siding as long as loose boards are properly nailed down. In order to prepare the wall properly, various objects on the exterior wall should first be removed. These include downspouts, molding, fixtures, and shutters, to name a few. Once the old siding and the old house wrap are removed, there may be loose caulk around doors and windows that need to be taken off. There may also be a certain amount of repairs that need to be done. If there are cracks around doors and windows, these need to be sealed with new caulk. 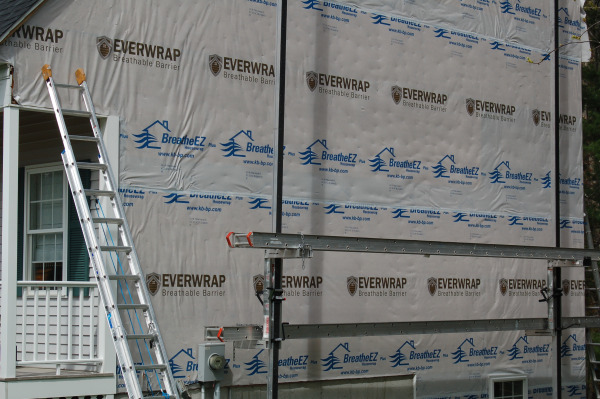 Everlast siding should ideally be installed over good quality underlayment. This material will provide additional protection against the weather and moisture. It can also provide additional insulation to help keep the internal temperature of the house more or less stable. On areas where there will be dissimilar surfaces such as rake boards, chimneys, doors, and windows, proper flashing must be applied to direct whatever moisture may build up towards the exterior of the house. Then, in order to ensure that the wall being prepared is level, a plumb line should be used. Everlast Composite Siding must be installed by a certified Everlast installer, it is best to hire a contractor to do the siding installation project. The project is an extensive one and most homeowners lack the knowledge necessary to do a satisfactory job. This will ensure that the wall is properly prepared and the siding is installed as specified in the manual.